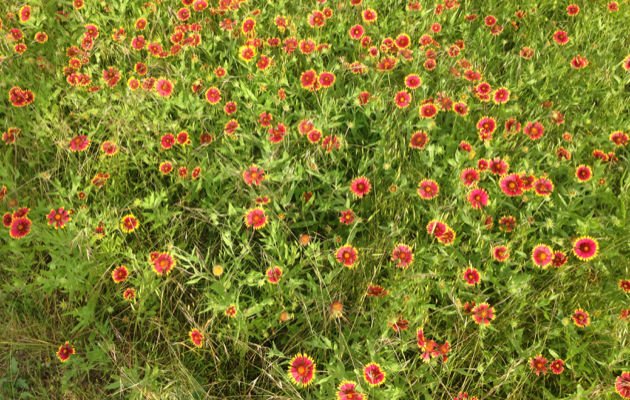 Our property is littered with wildflowers, prairie grasses and trees. I look after the trees, stripping them of brambles and vines, clipping out bag-worms, cutting up fallen boughs for the burn pile and dragging off dead branches. Hubs keeps the grass around the house and barn mowed, sulphur scattered in the beds to ward off chiggers and other biters, the woodland pathways cleared and the hay in the front pastures mowed a couple of times a year. We have a joint ongoing battle with thistle and have finally noticed a difference, large bare patches in the meadows are slowly being overgrown with blue-stem. Other plants closer to the house have been slow getting underway too and I’m afraid the heat of July and August will further hinder their coming forth. My cotton, that did so well last year, has done nothing in the bed I designated. 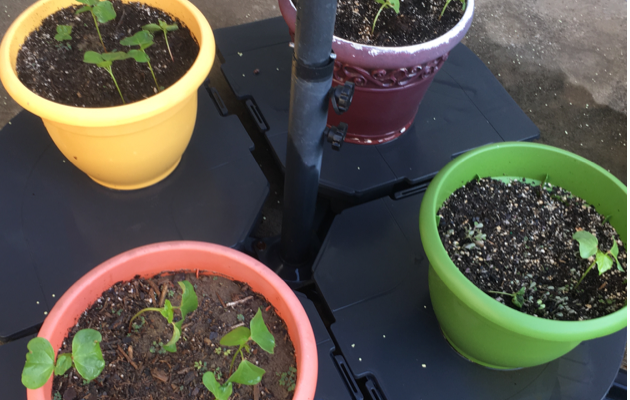 I planted several rows of seeds (harvested from my bolls) into well turned soil but only three small plants germinated and they’re not showing much promise. maybe it’s the seed and not the soil… or maybe it’s something in the water… but that’s another story! 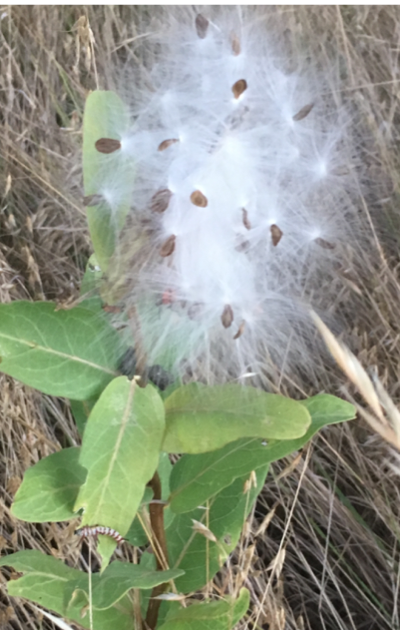 Anyway, I did get lots of milkweed and told Hubs to hold off mowing because the Monarch butterflies lay their eggs on the underside of the leaves and the hatched caterpillars feed voraciously for 9-14 days on this distinctive wild plant. 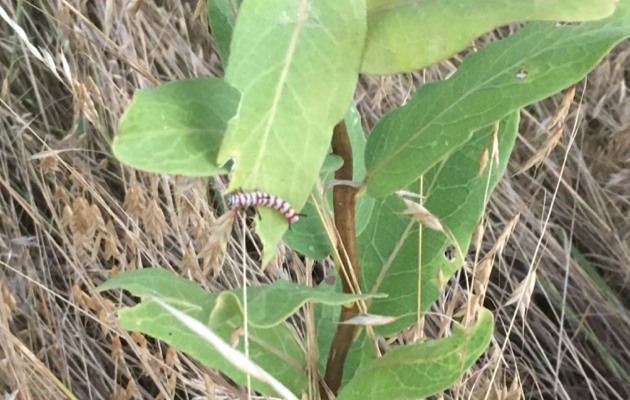 “We have to wait until the caterpillars have eaten and entered their chrysalis stage before we can cut,” I informed him knowledgeably. “How will I know when that is?” he asked. Luckily, because of his knee surgery, Hubs had other, more pressing, things to complete around the property before being laid up and was in no rush to borrow a tractor and cut down the hay fields. And it looked as though it was getting close to its chrysalis stage. We may see some third generation Monarchs flying around visiting flowers for 2-6 weeks before they lay their eggs and die. they migrate to warmer climes and fly around Mexico and Southern California for six to eight months until it’s time to start the whole process again. If I were a butterfly I’d want to be a fourth generation Monarch.